See hologram before purchasing the product. Lyne, Martin & Radford, UK. Both these toxicity test reports are available upon request to patients and researchers. Severn Trent Laboratories in Coventry, UK has also issued a Lab Test Report after doing a thorough Compound and Multiresidue Analysis. All these reports are also available upon request. 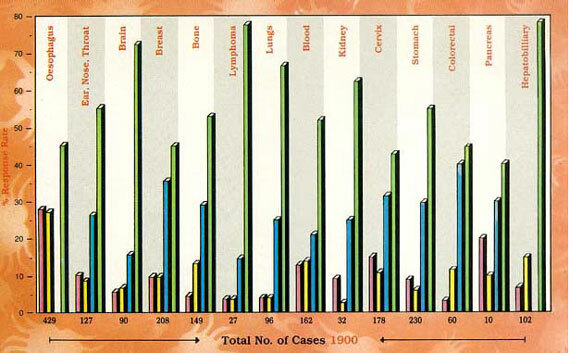 For individuals with potential hazard of cancer like smokers, tobacco addicts, drug addicts, alcoholics, residents of highly polluted areas, patients of chronic coughs, ulcers, women with consistent leucorrhoea problems and such other health hazards are strongly recommended to take CARCTOL regularly. In addition families with history of cancer patients are also advised to use CARCTOL as a preventive meassure. GILLIAN GILL, a healer and writer from Reigate, Surrey was diagnosed with ovarian cancer and secondaries in her liver in October 2000. The prospect was bleak she was told her cancer was too big for surgery and was offered chemotherapy and radiotherapy. As she knew what these treatments could do to the body, she told her doctors that she would try her own medicine for a month or two. "As a healer I decided it was time to walk my talk and to work on myself, giving myself, healing and self-hypnosis," she said. She contacted Dr Daniel the following month and in addition to self-healing and visualization techniques she adopted a new diet and drank up to nine pints of water a day. After about six months, when Mrs Gill said she felt she had reached a plateau. Dr Daniel suggested carctol and Mrs Gill added it to her regime. She continued to have her hospital seams and checks during which her consultant measured her stomach swollen by the tumour. "After the first six to nine months it was 13 finger widths down, and five or six months after that I could feel it going, like the arms of an octopus with lot of knobs, breaking off," she said. In February 2001 the liver tumours could not he seen on her scan, leaving only a shadow. By the and of the year the solid ovarian famous had become cystic-a sac full of fluid. Mrs Gill is convinced that carctol has been the key, despite the other holistic measures. "I am sure it is helping. I feel it puts me mentally in a splint. I have become more settled and I associate this with Carctol," she said. It was an unusual backache that look Stephen wood to his doctor. A cancerous lumps an another part of his body removed and Mr. Wood, 58 a retired teacher in the weald of kent, had a scan. This revealed a cancer in the spleen which was removed in 2002. Within months there was a lump on the arms and others in the neck where they could not be removed. He had surgery for the arm. His cancers were secondary melanomas although the primary cancer was never found. Mr. Wood was regularly checked but was next found to have two small cancers in the lungs. His wife had died of cancer two years previously and during her illness, they had consulted a GP and ayurvedic practitioner, Dr. Milind Jani, in Brighton, who prescribed the Carctol regime. Mr. Wood began his Carctol two years ago. He was already vegetarian. He adopted the low acid and water regime and drunk daily vegetable juice, had acupuncture and practiced raiki healing and meditation. Because he has no spleen, Mr. Wood continued to take penicillin to save off infection. "I was having regular scans and after six months, the cancers in the lungs were shrinking. Three months after that you could not see them on an x-ray and the lump in my neck had gone as well. "My last x-ray in august showed no cancer at all. The doctors are sort of interested, intrigued, personally, I don't think it's just the pills. I think it's the whole thing." "I think it's about changing the acidity of the body so that it is able to cope with the cancer cells. I have been given a gift a new attitude to life. There are so many possibilities before me." Barbara Jones is keeping an open mind. She says the really does not know whether it is Carctol or an experimental treatment given to her on the NHS that has done the trick. Mrs. Jones from London, has a complex cancer history. A scan that followed a kidney infection in 1997 revealed a liver tumour the size of a grapefruit which was removed. In 1999 it was established that she had thyroid cancer. Another cancer in her spine was found for which she had more surgery. By 2001 her liver cancer was back. She consulted Dr. Daniel in October 2002 and started the carctol regime together with healing and acupuncture. At the same time she began a thyroid treatment which involved radioactive therapy. "I have to say that my conventional doctors have been absolutely incredible," She said. "They have always been willing to go the extra mile for me. I don't want them to feel alienated and I have my scans three or four times a year." Mrs. Jones's liver cancers have not disappeared but they have not grown, as might have been expected. "My conventional treatment has been very, very important to me and so has the Carctol. I don't really know what has happened. All I can say is that since I started taking it the liver cancer has not grown," She said. Mrs. Jones also speaks of the gift of life she feels has been given. "I used to be a control freak. Now I am in a serene and happy place. It feels as if an incredible gift has been handed to me. I feel so lucky, so very fortunate." "As time passed, my energy increased and my daily walks started getting longer, as I was able to enjoy my passion and love of the outdoors." "Our mission is to offer products as well as services of the highest professional standards in order to make the whole world Cancer Free." Copyright © carctol 2018, All rights reserved.